In part 1 we talked about a customer of BFC Networks who received an email around being ready and completing a survey before they could upgrade (they are still waiting for the next step). 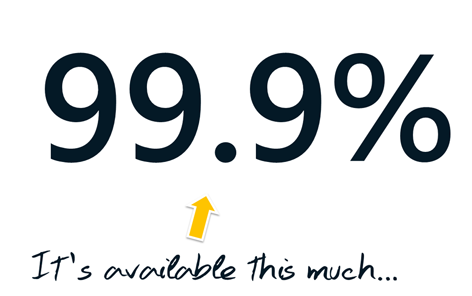 Interestingly, another customer of ours has had an email to say they can upgrade now. They didn’t received a readiness survey. 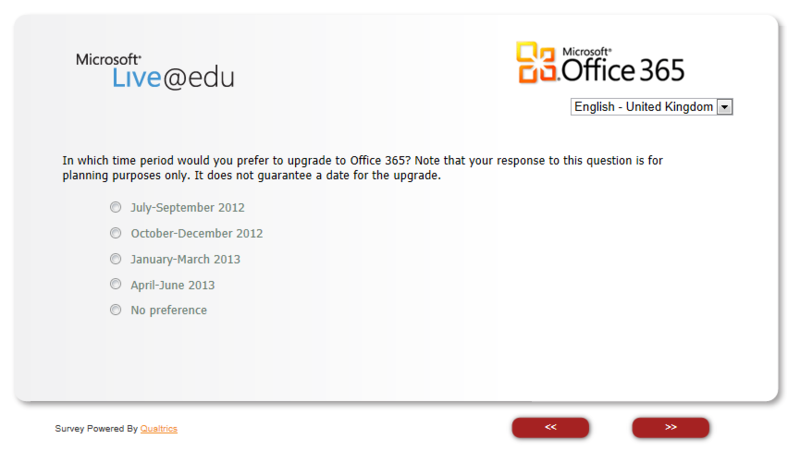 Customer is invited to upgrade from Live@edu to Office 365 for education now. You preserve and extend your investment in the world’s leading productivity suite while giving your faculty, staff, and students the features they already count on—and more—for free. Once you complete the automated upgrade, Customer.com (and any accepted domains) will be subscribed to the free Exchange Online Plan 1 for academic. You don’t have to move email, calendars, or contacts; re-provision accounts, or retrain people on how to use email. 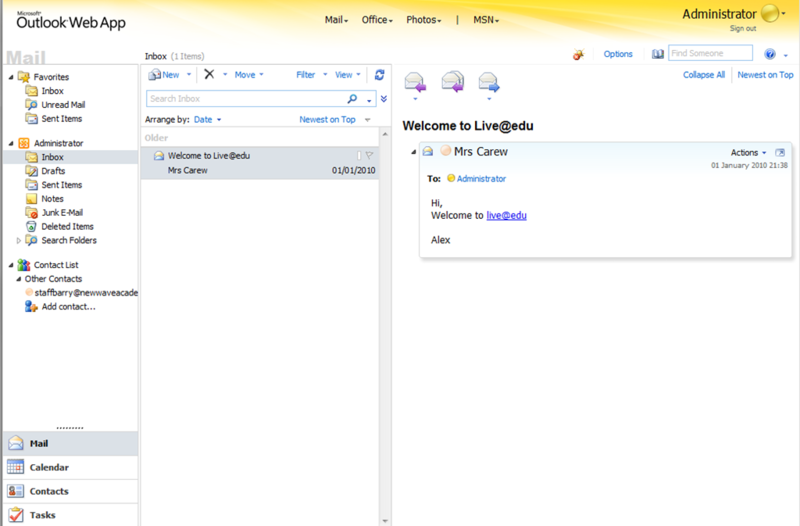 So I’ve logged into the live@edu tenancy and have found an extra box has appeared on the front page. 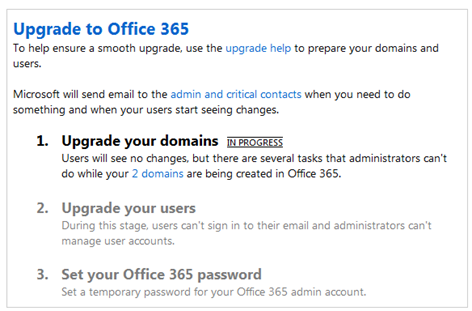 Click UPGRADE DOMAINS and you will notice that the first section now says IN PROGRESS. For this tenancy the IN PROGRESS stayed on the page for less than 25 minutes but you have to manually refresh the page to see if there are any differences. Once it is completed the page will look like this. Select UPGRADE USERS. 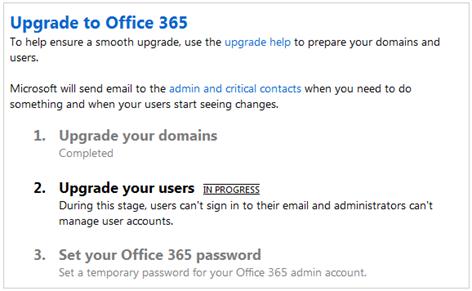 While the upgrade takes place, users will not be able to access their email. You are asked to log in again and the upgrade of users will take place. This process took 10 minutes for my number of users and I had to refresh the screen to find out if it had completed or not. 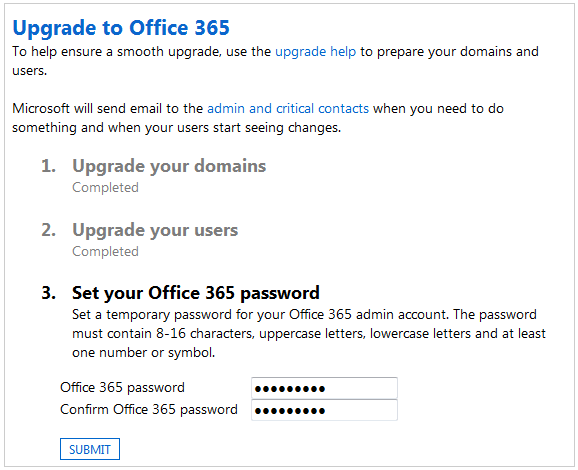 Step 3 is to create a temporary password for the Office 365 Admin Account. 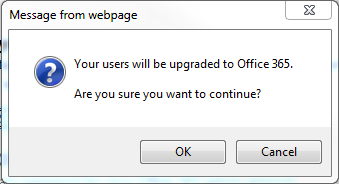 You are now shown a upgrade complete page. If you want to read the after-upgrade checklist for administrators you can by clicking here. You now need to log into Office 365 for education! 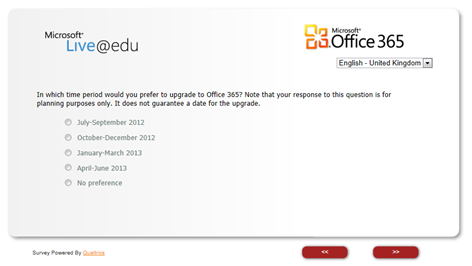 One of my customers has received that all important email about migrating to Office 365 for education. 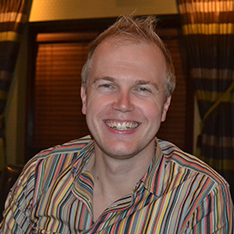 Thank you to Martin to allow me to blog the process they have gone through. 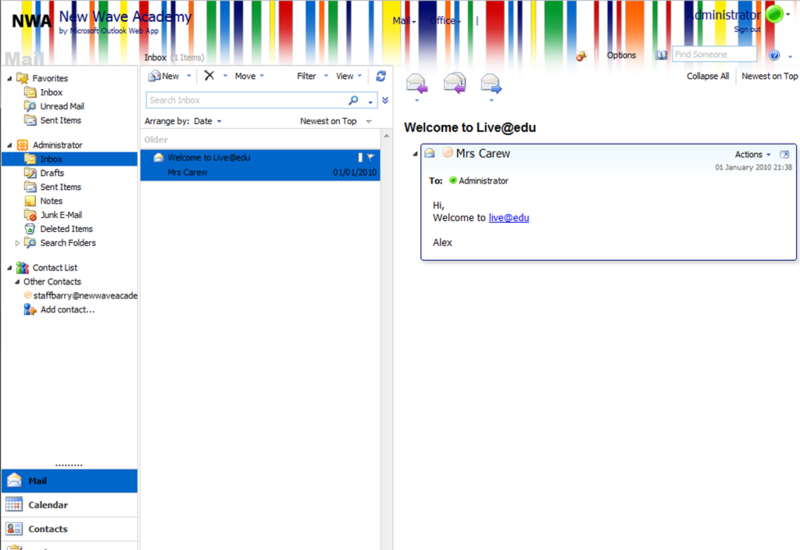 =”mailto:Live@edu”>Live@eduemail services called Prepare for the Live@edu upgrade and will be asked to complete a readiness assessment. When the link has opened you will get this website. The first question is around your domain. Note: I have covered the domain name which is listed on the page. The next question is around how you provision accounts. You are then asked about how your passwords are changed. Single Sign On is next. You are next asked how to plan to create users in Office 365. This might be different for different tenancies (I don’t know). Select when you would like to be upgraded. Remember that Microsoft have said that is not guaranteed. 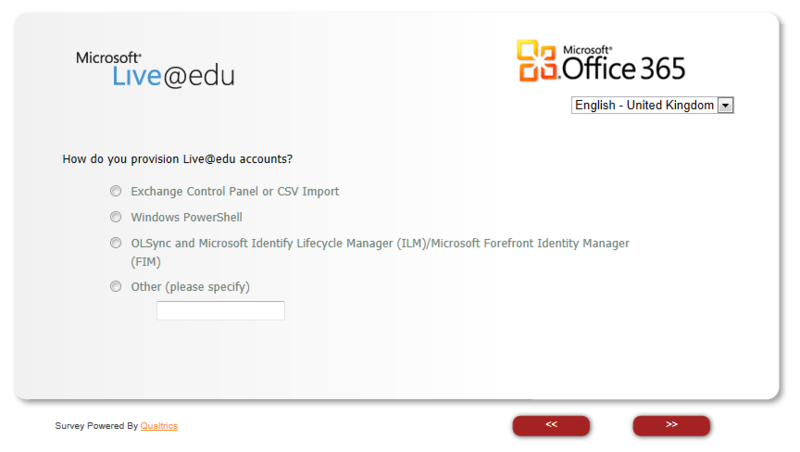 That is the last of the questions and you are ask to click next to be taken back to the live@edu Upgrade Centre. Once this customer is notified of their upgrade I will blog part 2 (what ever the next step are). Microsoft have started sending information out to different school about their current tenancy and it’s migration to Office 365 for education. Here’s that information if you don’t receive the emails. 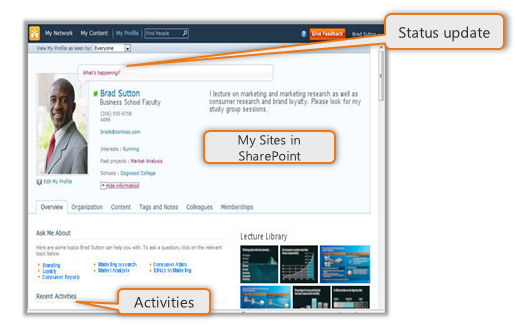 Office 365 for education will provide free Exchange Online, SharePoint Online and Lync Online to students, faculty, and staff. Starting in summer 2012, Microsoft will begin upgrading educational institutions using Live@edu to Office 365 for education. 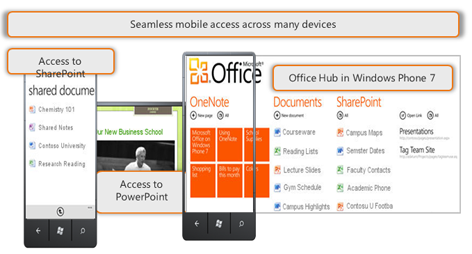 This upgrade gives students, faculty and staff free access to the same versions of key Office 365 tools available to enterprises, extending your investment in Live@edu. This upgrade does not require mailboxes, calendars, or contacts to be moved; reprovision accounts; or re-train users on e-mail. Your users can keep their email address – plus get new tools that make it easier to communicate and collaborate. The automated upgrade process will automatically subscribe you to Exchange Online Plan 1. 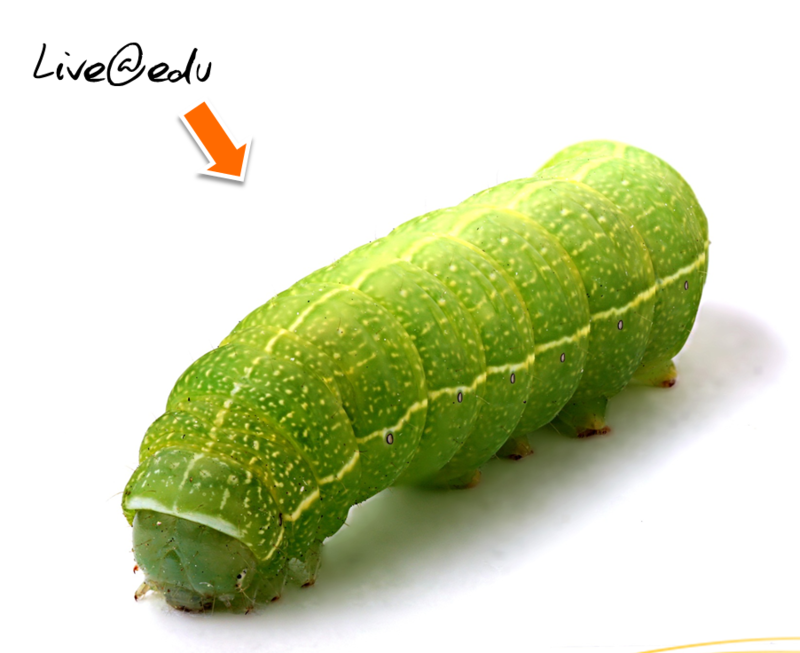 For now, continue to use your current Live@edu services and look for further announcements about the upgrade. 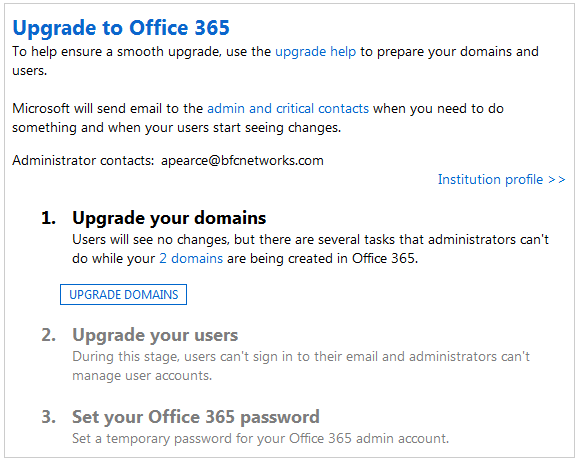 You’ll receive an email letting you know when your institution can upgrade, including details on how to start the automated upgrade process and resources for notifying students and training your help desk. Make sure your contact information and Institution Profile are correct in the Live@edu Service Management Portal. 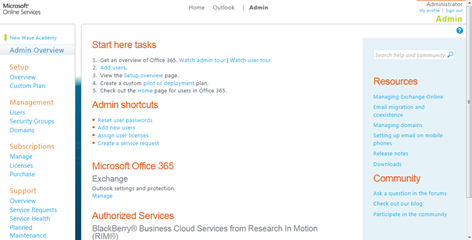 Review the Office 365 system requirements, and make sure all client desktops are ready. 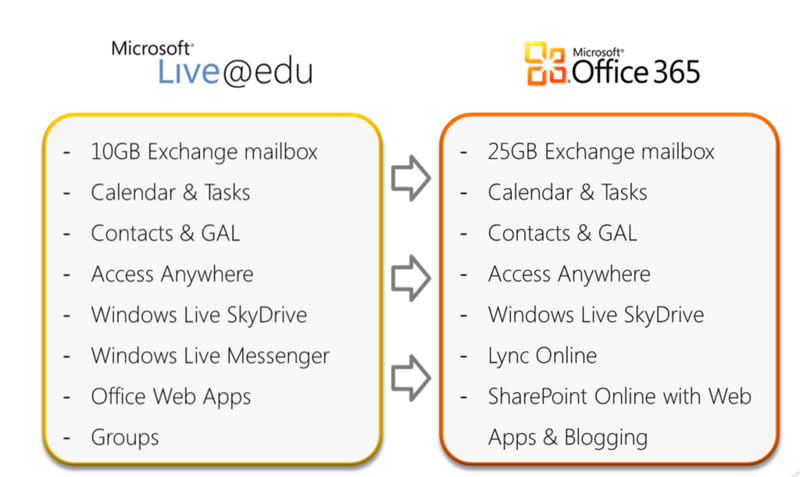 For a high-level preview of what to expect, visit the Live@edu to Office 365 upgrade centre. We appreciate your commitment to the Microsoft platform. 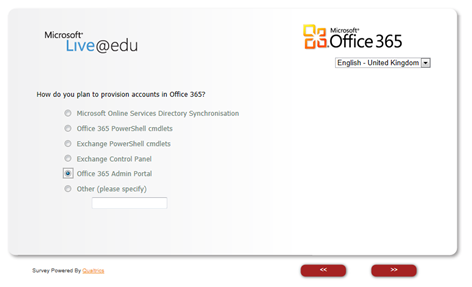 We look forward to upgrading your educational institution to Office 365 for education. I have a few customers that I look after from a live@edu point of view so I receive notification from Microsoft about updates to the customers tenancy such as SSO certificates as well as Microsoft general update emails. I have received a very interesting email in the last week which might help answer a few questions for when the service is migrated to Office 365 for Education as well as the recent changes to SkyDrive (which you can also read here). 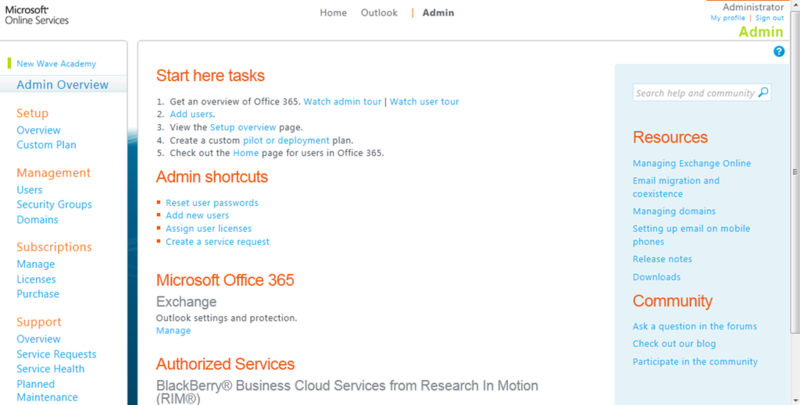 At the bottom of the email (and this post) you will see that it talks about SkyDrive not being included in Office365 but it confirm that Microsoft will allow you users to continue to user the SkyDrive services when they are migrated to Office365 for education. We wanted to send you some information about recent updates to SkyDrive. These new apps and features make SkyDrive the most powerful personal cloud storage service available and help your users to stay connected with the files most important to them. SkyDrive for Windows (Vista, 7 and 8): SkyDrive is now automatically available from any desktop app and within Windows Explorer — supporting files of up to 2 GB (20x increase) and offline access. SkyDrive for Mac: Brings our powerful file syncing app to the OS X Finder. Upload larger files: Now you can upload large files: up to 2 GB from your desktop or up to 300 MB from SkyDrive.com. 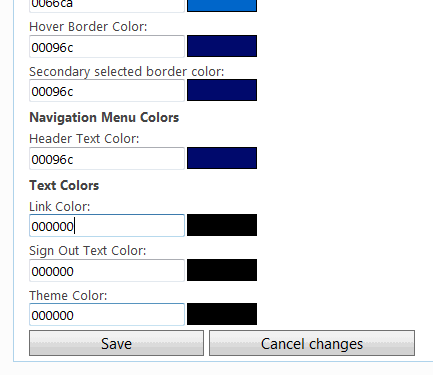 Fetch: Forgotten to put a file in your SkyDrive folder? Not a problem. You can access any file stored on your Windows PC from SkyDrive.com in your web browser remotely. SkyDrive updates for mobile devices: – Access and share any file on the go with SkyDrive for Windows Phone, iPhone or iPad. In addition, we are announcing new, more flexible storage options – up to 100 GB of additional storage. Users receive 7 GB of free storage, which is more than any other service. It is enough to keep about 20,000 Office documents or 7,000 photos, which is more than enough for most people. Our data shows that 99.94% of all SkyDrive users currently store less than 7 GB, so this change will not have a significant impact on how people use SkyDrive. For those who have been using SkyDrive regularly, as a thank-you for being loyal customers, we are offering the opportunity to keep their SkyDrive storage limit at the original 25 GB for a limited time. Users who currently store more than 4 GB in their SkyDrive have automatically been upgraded to 25 GB. Please note that users who qualify for the offer have been notified in-product. Those who have SkyDrive accounts but have never utilised the service are not eligible for this offer, so we ask that you do not communicate this offer broadly to your users. We value our relationship and Live@edu’s partnership with your establishment, and we realise this is an appreciable difference from what was originally offered with the service. This decision did not come about lightly, but was a necessary change that allows us to better meet our users’ needs by offering easier-to-use and more flexible cloud storage. We’re excited about the new features and apps for SkyDrive and look forward to delivering more SkyDrive improvements in the future. For more information please visit the SkyDrive homepage, share the SkyDrive at School page with your users or, if you have any questions, please post them on Microsoft Answers. 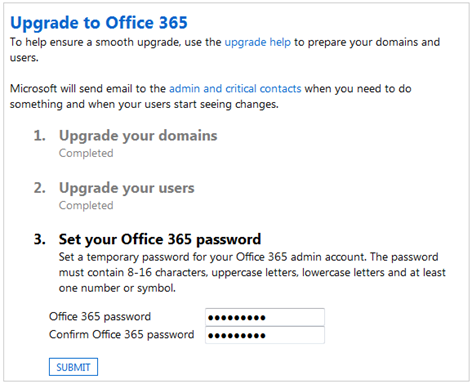 Although SkyDrive is not included in Office 365, it’s important to note that your current SkyDrive users will not lose anything they store in SkyDrive after your establishment upgrades to Office 365 for education. 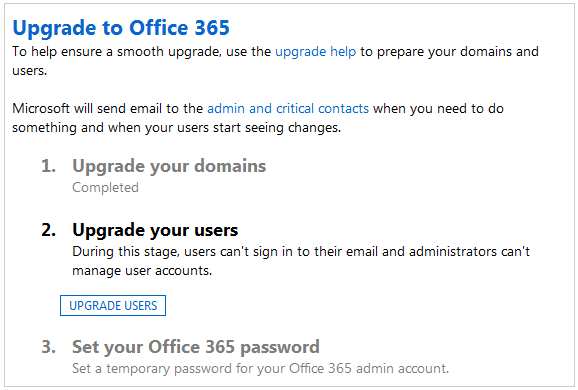 Your users will continue to have access to all their files in SkyDrive, plus your establishment will have the added benefits of SharePoint Online with powerful features like intranet sites, seamless integration with Exchange Online and Lync Online, as well as a rich set of enterprise-level administrative tools not found in SkyDrive and other consumer services. 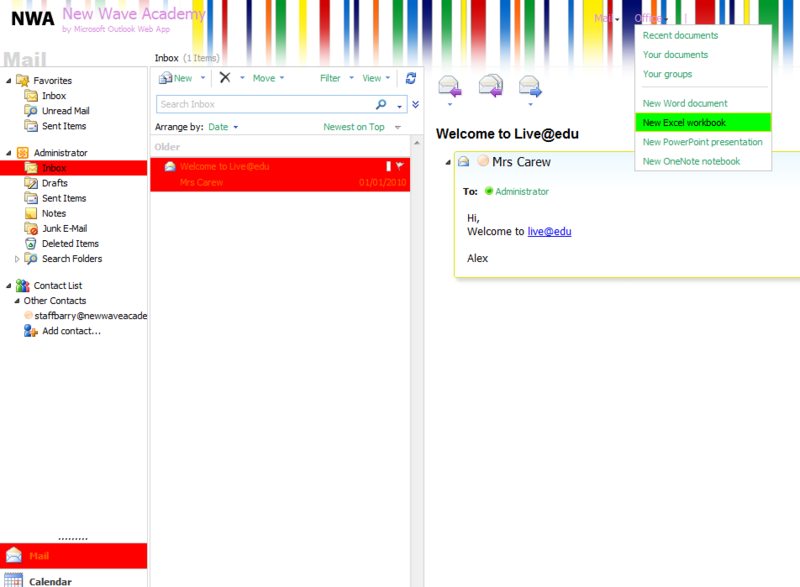 In this blog post we are going to brand our live@edu Outlook Live Web Access. By default you get the standard yellow theme which is a collection of 3 images and some colouring. 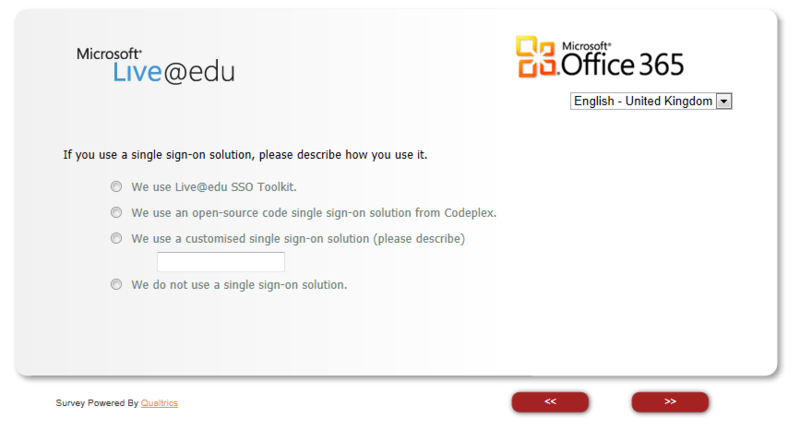 This can all be changed within the domain management which you can access with your admin user for live@edu. Note: Any changes you publish can take up to 24 hours to be deployed if you have kept to the image size guidelines. 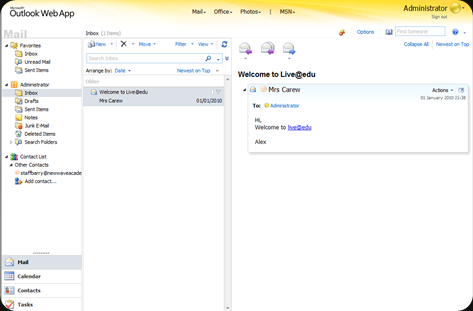 Go to http://domain.live.com and login with you live@edu admin account. 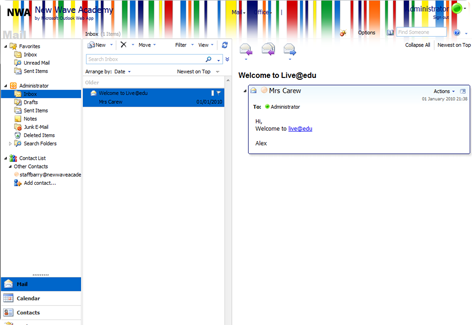 Down the left hand side you will see a navigation bar. Select Co-branding and then Outlook Live. There are 3 images in total. 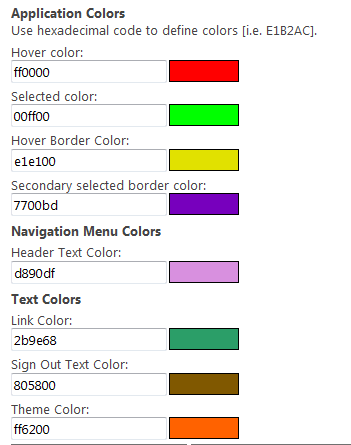 Here is what they are by default. To help understand where these are I have branded a site with 3 colours, Red, Blue and Green for you to see where each of the images sit. When creating new images for your site you should meet the requirement of the size otherwise you will have problem uploading the images and publishing your changes. You should save the file type as a PNG. The side background banner on the left is the image you uploaded (green). The image located on the right is a reflection of the image. 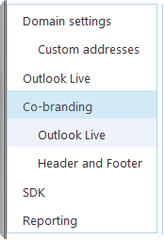 At the bottom of the Outlook Live Co-branding page there are several options to change the colours which are stored in the CSS file. To help understand which colour is where on the page I put together a little chart. We can preview our design before publishing it out for everyone to see. 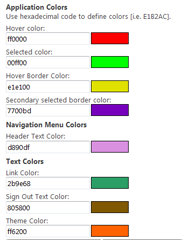 Fill in your co-branding page, upload your images and fill in the colour for the application colour and click Save. You won’t be able to see your design yet. Down the left hand side click on Co-branding. Then click on Preview changes. Only your account will be able to see the branding changes. Note: You may need to clear your internet cache before seeing the changes. Once you are happy with your design hit the publish button. 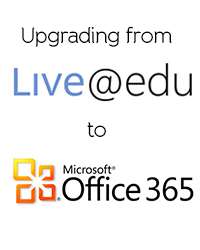 Yesterday I posted ‘Office 365 Videos from TechEd Europe’ but there is also another session on live@edu. I hope that you enjoy this session too. 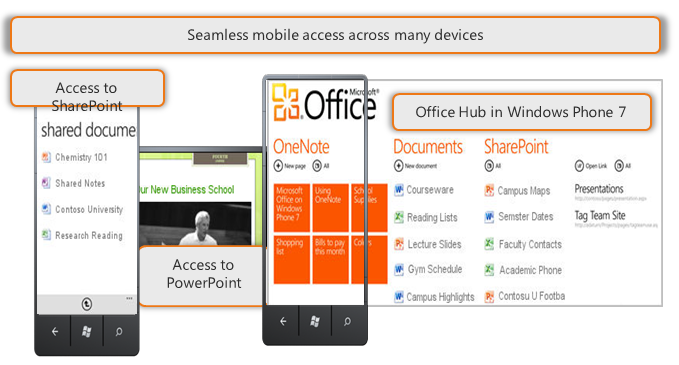 More information has come out from Microsoft this week around Office 365 for Education. 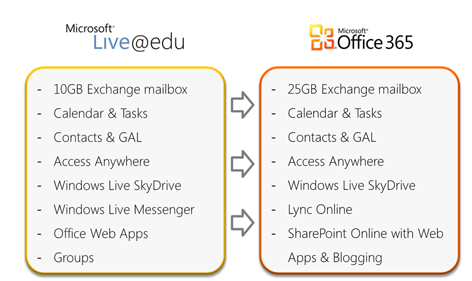 As mentioned in a previous post we only had limited information but during the past week Microsoft had a presentation day for Higher Education establishments which included a presentation on live@edu and Office 365 for Education. 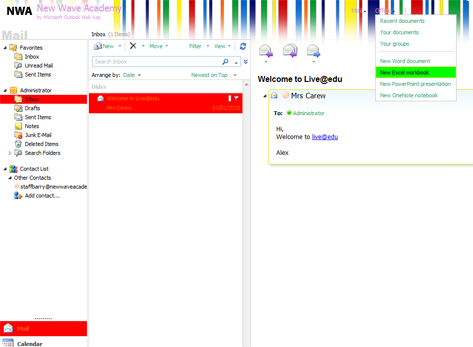 In previous posts we discussed what’s coming in new and the differences to the current live@edu. Here is a better view from the presentation. Connect securely over Internet with HTTPS without the need for VPN. 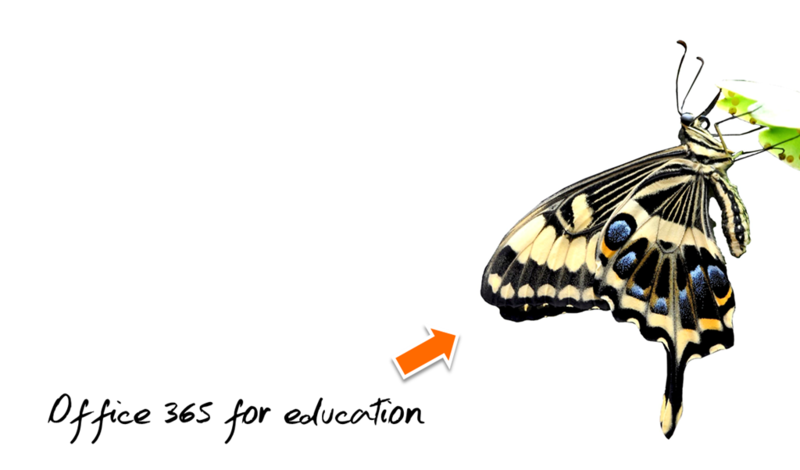 Ease of interoperability with existing systems, such as SunGuard and Blackboard, through extensible platform.